International competition recognizes SweetRush’s creativity in eLearning and training videos. San Francisco, California, April 4, 2017— The Muse Creative Awards announced winners for 2017 and honored SweetRush Inc. with three prestigious awards. SweetRush won two awards in the Video Training category and one in the Website eLearning category. 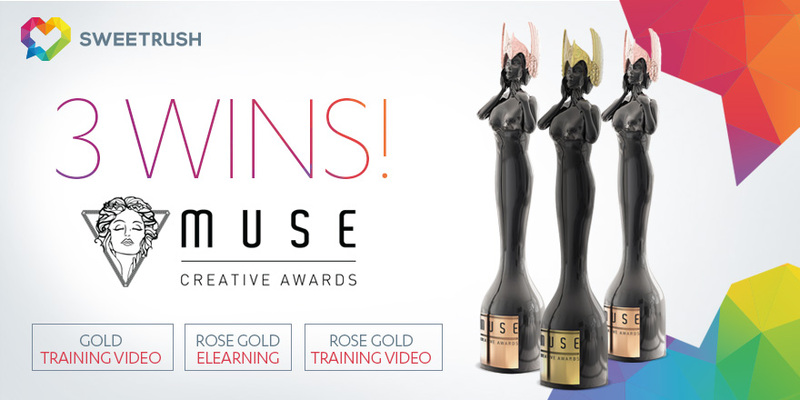 The Muse Creative Awards is an international annual competition for creative professionals who inspire through concept, writing, or design using traditional and electronic media. This year, the organization received more than 1,500 submissions from 35 countries. Muse Creative Awards is administered and judged by International Awards Associates (IAA) and a carefully selected panel of internationally recognized creative professionals. IAA oversees awards and recognition programs, provides judges, and sets competition standards for excellence. This year’s panel includes 47 judges—some renowned, some experienced, and some brand new—from 19 countries. They hail from leading companies in the creative industry and include professionals from such power brands as Guinness World Records, Grey, Grayling, and Ogilvy & Mather.